Gentle and Nourishing for Everyday Use! Formulated with only the good stuff. 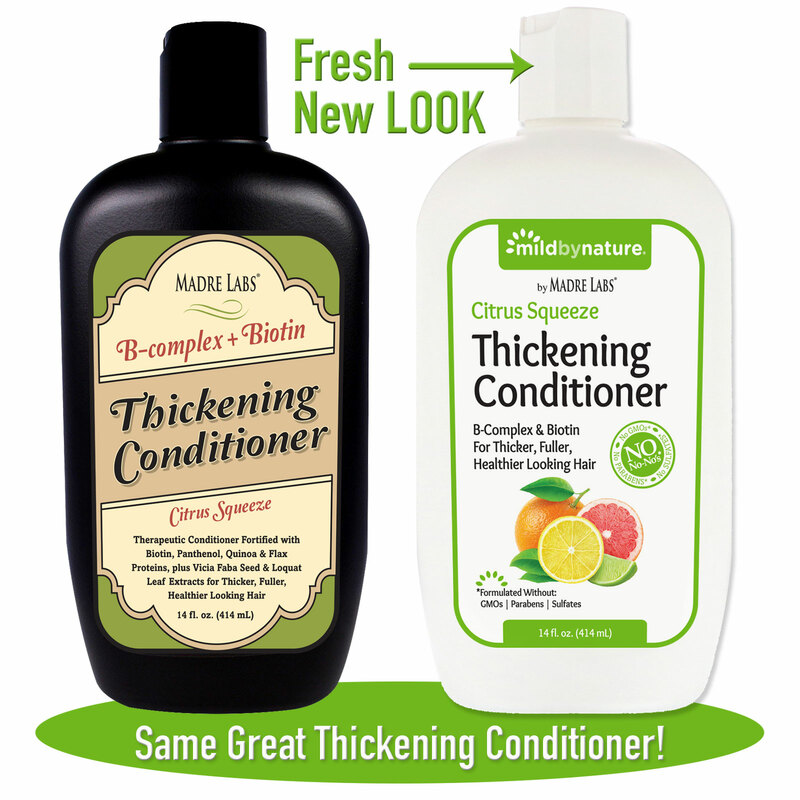 Mild By Nature Thickening Conditioner is fortified with Biotin, Panthenol, Quinoa and Flax Proteins, plus Vicia Faba seed and Loquat Leaf extracts for thicker, fuller, healthier looking hair. 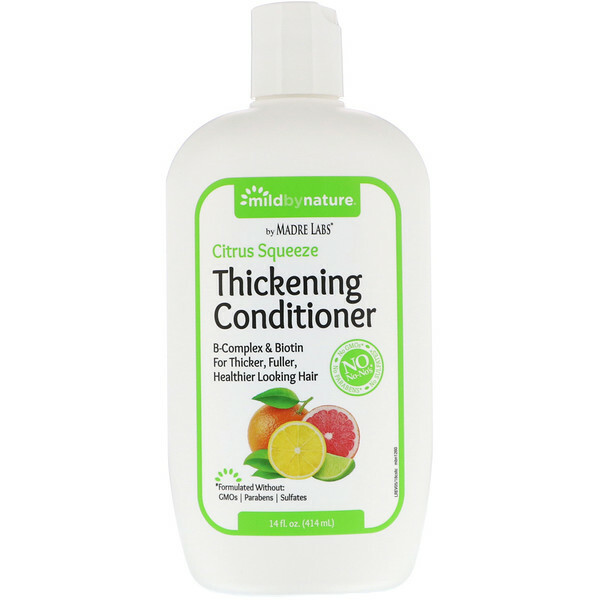 This therapeutic conditioner is pH-balanced, cruelty free contains no “no-no’s”: no GMOs, no sulfates, no parabens. Two fresh scents of shampoo and conditioner available. Shake before each use. After shampooing, massage conditioner gently into wet hair and scalp, working through the ends. Rinse thoroughly. Water (aqua), cetearyl alcohol, aloe vera (aloe barbadensis) leaf juice, behentrimonium methosulfate, hydrolyzed flax protein, stearamidopropyl dimethlamine, gluconolactone, grapefruit (citrus grandis) fruit extract, glycerin¹, hydrolyzed quinoa, behentrimonium chloride, amodimethicone, pro-vitamin B5 (panthenol), PCA glyceryl oleate, lavender (lavandula angustifolia) flower/leaf extract, orange (citrus aurantium dulcis) peel oil, sodium benzoate, vanilla bean (vanilla planifolia) fruit extract, bergamot (citrus aurantium bergamia) fruit extract, shea butter ethyl esters, coconut (cocos nucifera) oil², argan oil (argania spinosa) kernel², geranium (pelargonium graveolens) oil, lemon (citrus limon) peel extract, sage (salvia officinalis) oil, apple (pyrus malus) fruit extract, patchouli (pogostemon cablin) leaf extract, phytantriol, loquat (eriobotrya japonica) leaf extract, vitamin B7 (biotin), hydrolyzed corn protein¹, broadbean (vicia faba) seed extract, citric acid.